The Historic Centre of the Town of Olinda has maintained its urban fabric from the Portuguese colonial period. Among this are 20 Baroque churches. The settlement of Olinda was founded in 1535 by the Portuguese. It was subsequently burned by Dutch invaders, and then rebuilt in the 18th century. Its existence is strongly linked to the sugar-cane industry in this region. The streets are a real invitation to go back in history and imagine those streets in past centuries. The buildings are well maintained, the streets are safe, and there are extremely hospitable people. Olinda has a great cooking heritage too. The gourmet ones will be happy with the flavours and mixtures brazilian people do at this place. 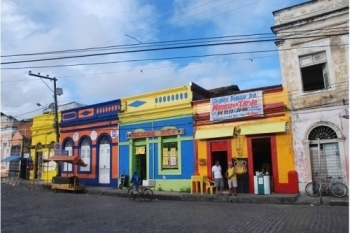 Olinda is a town founded during portuguese colonization in northeastern Brazil. It lies only a few kilometers from the capital of the State of Pernambuco, Recife, and has many churches and buildings from the 17th and 18th centuries, all framed by the blue ocean that can be seen from its hilly cobblestone lanes. Olinda reaches its pinnacle during carnival, but all over the year is a charming place to visit. Olinda was burnt down by the Dutch during their conquest in the 17th century, but has been entirely rebuilt after the Portuguese reconquest and not much has changed since then in its historical centre. Recife, the neighbour city, has plenty of attractions and also an international airport that make it easier to visit both cities. I visited Olinda in early February 1993. That date will tell those who know Brazil that preparations for Carnival were in full swing. The streets were often blocked by samba bands practicing their routines, some already in full fantastic dress. It was my first stop on my first visit to Brazil (having flown to the adjoining city of Recife from Paris). The weather was hot and sunny with some scattered cloud. Olinda was for some time the capital of Pernambuco and, spread out over some small hills, has a considerable number of fine buildings (mostly churches).Many were in desperate need of repair when I was there. Like many Brazilian cities Olinda has a reputation for muggings but apart from a few, easily deterred, would-be guides I received no unwanted attention and much enjoyed my time there which made for a gentle introduction to this vast and diverse country. Slavery: The city is built on wealth from sugar grown and harvested by slaves in the plantations of Pernambuco. In the Pra?a da Aboli? ?o (Abolition Square) is a statue of Princess Isabel, who, in 1888, signed the Lei Aurea (Golden Law) abolising slavery in Brazil. She did this as regent whilst her father Pedro II travelled abroad. The law (signed in Petropolis) was promulgated in this square. Built or owned by Dutch: In 1630, the Dutch invade Olinda and dominate Pernambuco. The dominance lasted from 1630 to 1654. 46 Community Members have visited.